The zombie apocalypse is coming to campus for an emergency preparedness drill! We’ve all seen the movies - so before the zombie horde infects the entire campus, or worse, the city - if you “See Something? Say Something!” UNLV’s Office of Emergency Management is counting on YOU to report any zombie sightings and help prevent a pandemic! But first, you'll need to download the RebelSAFE App. SEE a zombie? SAY something! Take a photo with a zombie and submit it via the “Emergency Management Be RebelSAFE” button in the RebelSAFE App. The zombie horde will be walking throughout campus looking for brains. Zombies can also be spotted at three different tables (near the SU, Lied Library, and RLL) where you can learn more about what it means to #BeRebelSAFE. Be entered to WIN 1 of 6 $25 Amazon gift cards for your valuable tip which helped to keep our campus safe from intruders. So now that you know what to do in case of zombies…or gas leaks, flooding, active assailants, etc. you’re ready to help protect our campus! 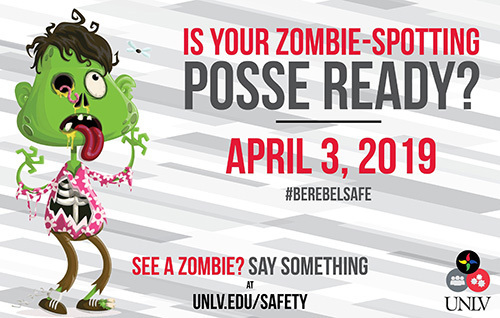 And remember, even after we’ve successfully battled the zombie horde, if you see an actual unusual item or situation, report it to UNLV Police via the Report a Tip button on the RebelSAFE App. For more on participation and contest rules visit UNLV's website.